The summer temperature forecasts for the U.S. are beginning to roll out, and so far it’s mostly good news for the North Texas region. In outlooks released this month by the NOAA, Weather Channel, AccuWeather and Weather Underground, the general consensus is that the East and West Coasts will experience higher than average temperatures this summer. 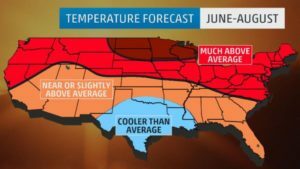 In Texas and other Southern states, temperatures are expected to be average or lower than average through June, July and August. Weather forecasts, especially those with a 90-day outlook, can be very complicated. After reading through these varied forecasts, we came away with the understanding that the transition from a strong El Niño event to La Niña conditions over the summer will be responsible for the higher temps on the coasts and in the Northern U.S.
Let’s hope the forecasts come true, and maybe we’ll experience a summer in the Granbury area that’s not too hard on our air conditioning equipment and electric bills. Just remember not to get too complacent — don’t delay calling your Daffan Cooling & Heating technician to have your HVAC system checked out. The average date of the first 100 degree temperature in North Texas is July 1, though it’s not unheard of for triple-digit temps to arrive in June. Speaking of air conditioning, you may have heard that the Texas Rangers and the City of Arlington recently announced plans to build a new $900 million stadium for the team. The proposal is for a stadium with a retractable roof and an air conditioning system that can be used when necessary. If Arlington voters approve a sales tax increase to help fund the proposed stadium, we may hit the air conditioning trifecta in Texas in a few years: step out of your air conditioned home into your air conditioned car and drive to watch air conditioned baseball. Spend a summer in Texas without breaking a sweat!